"Adele Bloch-Bauer I. This magnificent portrait of the wife of a Viennese sugar magnate glimmers with gold and silver leaf. Extravagant and sumptuous, the painting captures Adele in a dazzling canvas inspired by Byzantine mosaics and Egyptian motifs. Considered the masterpiece of his "Golden" period, Gustav Klimt spent 3 years completing this spectacular work, which depicts the only woman he ever painted twice. "The portrait, Adele Bloch-Bauer I, was created by Gustav Klimt. A Symbolist painter of the Belle Epoque and leader of the Vienna Secession, Klimt dominated the Austrian art scene at the turn of the century. 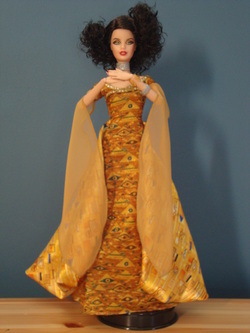 Barbie® doll celebrates Klimt's opulent vision and the golden glory of Adele Bloch-Bauer I with Barbie® Doll Inspired by Gustav Klimt, part of The Museum Collection." "Mona Lisa. The enigmatic portrait, 'La Gioconda,' is often called the most famous painting in the world. Mysterious and beautiful, this masterpiece of the High Renaissance has beguiled art loves for over 500 years. The riddle of Mona Lisa and her smile has inspired poems, songs, plays, and novels. Once owned by the King of France and Napoleon Bonaparte, the painting now belongs to the people of France–and the art lovers of the world–and is housed at the Louvre. "Mona Lisa was created by Leonardo da Vinci. A true Renaissance man, Leonardo was an artist, sculptor, scientist, inventor, engineer: a genius who was perhaps the most creative mind of his era. 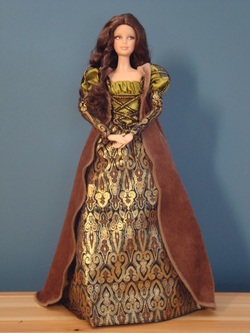 Barbie® Doll celebrates the billiance of Leonardo and the splendor of Mona Lisa with Barbie® Doll Inspired by Leonardo da Vinci, part of The Museum Collection." "Cypress trees twist skyward. A crescent moon ablaze with a golden halo glows amidst a sprinkling of gigantic stars. The swirling heavens above the French village of Saint-Rémy were painted by Vincent van Gogh in the last year of his life. Considered his masterpiece, The Starry Night has inspired songs, poems, and orchestral works. This iconic work continues to captivate art lovers everywhere. "The Starry Night was created by Vincent van Gogh in 1889. Although he painted for only 10 years, van Gogh is considered to be one of history's greatest artists and a powerful influence on modern art. 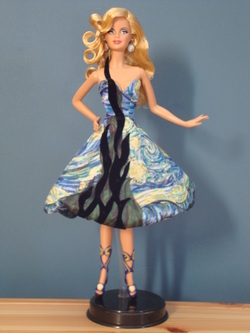 Barbie® doll celebrates van Gogh's genius and the sublime beauty of The Starry Night with Barbie® Doll inspired by Vincent van Gogh, part of The Museum Collection."